This is an extremely rare Thai language map of Southeast Asia featuring Thailand, Laos, Malay, Singapore, Vietnam and Cambodia. It covers from the Guangdong province in China, including Hainan and Macao, south to include parts of Sumatra and Borneo and west as far as Bangladesh. Singapore Island is noted and identified. The map notes rivers, islands and political divisions throughout. 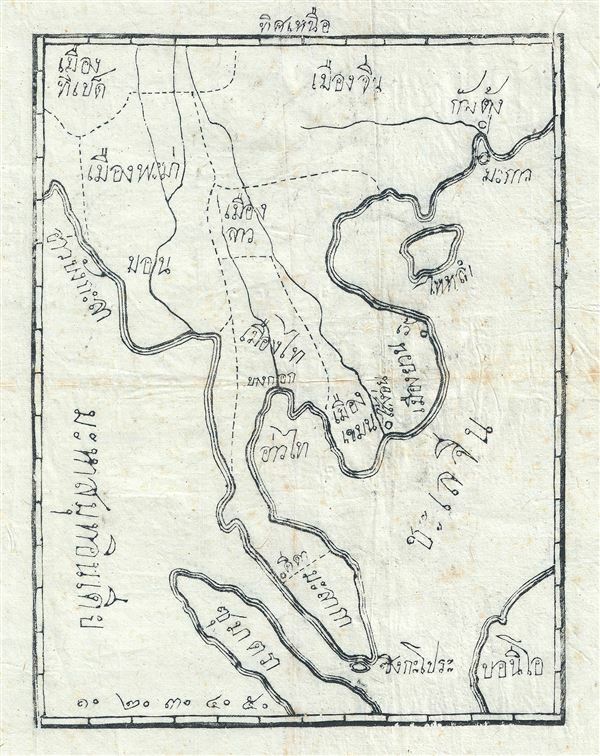 Beautifully engraved in woodcut on laid rice paper, this map was drawn just prior to the Franco-Siamese War between the Kingdom of Siam and the French Republic, which would ultimately result in the secession of Laos to the French. Thai language maps are of exceptionally rare. We have so far never encountered any Thai language maps on offer before, making this an extremely rare opportunity. This map, along with another Thai map featuring India and Southeast Asia, was acquired from a missionary family whose ancestors worked in Thailand in the late 19th century. Click here for the 1890 Thai Language Map of India and Southeast Asia (Thailand, Cambodia, Vietnam, Singapore). Very good. Printed on laid rice paper. Minor spotting.